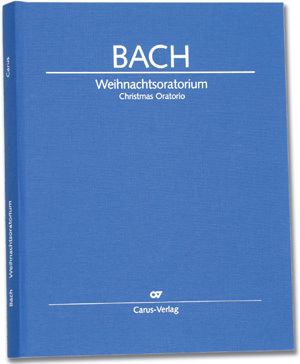 With the edition of the Christmas Oratorio within the framework of the Stuttgart Bach Editions, Carus presents a scholarly edition for practical performance. 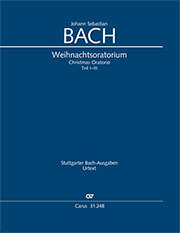 The basis for this publication are Bach’s autograph score and the original parts. 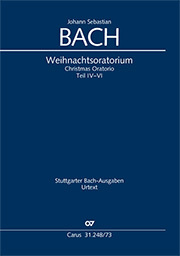 The conducting score contains an appendix with a concise Critical Report which provides information about the sources and their readings; when necessary, the latter are discussed in more detail, especially with regard to how the editor arrived at solutions for questions of articulation which differ from those found in previous editions. 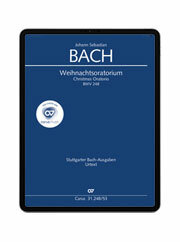 The representative, clothbound volume is supplemented by a study score as well as a choral score, a vocal score, a vocal score XL and complete orchestral material. 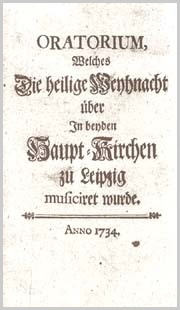 In the orchestral material short excerpts containing the conclusions of the secco recitatives are rendered with cue notes in separate vocal systems printed above the score where the instrumentalists pause, thus enabling them make their entrances in the movements which follow these recitatives. 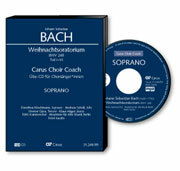 This work is also available in carus music, the choir app!